HA NOI (VNS) — The United States Agency for International Development (USAID) has given Viet Nam US$2.1 million to help it fight against animal diseases, officials said. Viet Nam's agriculture and rural development deputy minister, Vu Vãn Tám, and the Country Representative of Food and Agriculture Organisation of the United Nations (FAO) in Viet Nam, Jongha Bae, signed the project here yesterday. The project, titled "Risk mitigation and management of human health threats along animal value chains," aims to both prevent animal diseases and improve breeders' living standards. It includes four main components: One-Health mechanisms and collaboration; disease risk reduction along livestock value chains; surveillance for disease prevention and control; and cross-border collaborations in the lower Mekong and Red River deltas to prevent the spread of disease. "Our new project will be built upon the long-standing successful avian influenza emergency response programme previously implemented by the FAO Emergency Centre for Transboundary Animal Diseases Operations (ECTAD) country team," Bae said at the signing ceremony. "And they will once again play an important role in ensuring FAO collaboration and support in Viet Nam." 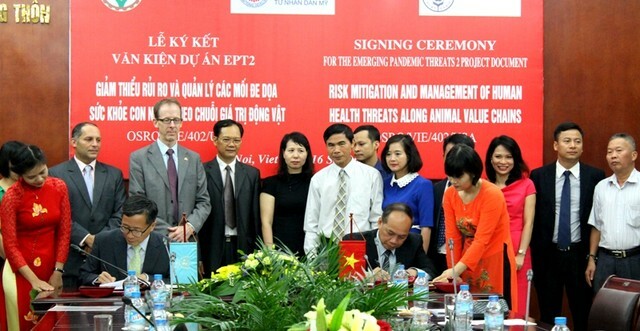 The Vietnamese deputy minister expressed appreciation for USAID's support through the FAO to help Viet Nam fight against avian influenza, pledging that the agricultural ministry would closely supervise partners in order to implement the project effectively. Dr. Scott Newman, the Senior Technical Coordinator of FAO ECTAD Viet Nam, said the co-operation between the FAO and Vietnamese Ministry of Agriculture and Rural Development had resulted in reducing the impact of the avian influenza virus on poultry and people by improving the country's capacity to detect and respond to the disease.